We have seen many big and powerful telescopes over the years allowing us to explore other galaxies and beyond but NASA is now building what is known to be the most powerful telescope ever seen. This new telescope will give the scientists a chance to witness cosmic events which occurred billions of years ago probably up to the limit of 13.5 billion years. Known as James Webb Space Telescope (JWST), it is going to be hundred times powerful than the already established Hubble Space Telescope. It is expected to launch and be at its maximum functional capacity within the next three years. 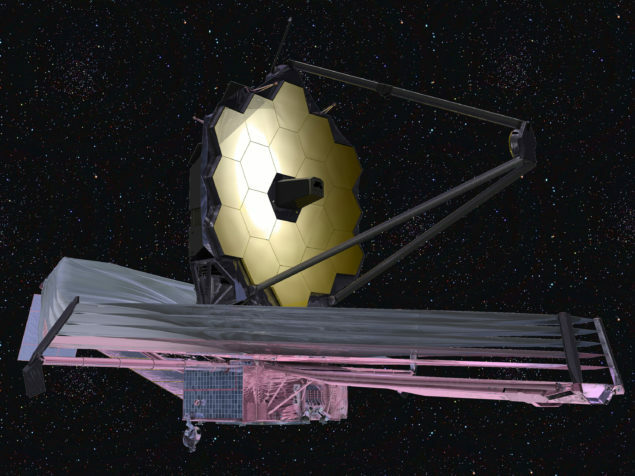 James Webb Space Telescope contains a mirror approximately 6.5 metres in diameter. This 6.5 metres mirror is thrice the size of Hubble Space Telescope’s mirror and it also possesses an estimated seventy times more light gathering capacity. JWST includes spectrometers and cameras, four in number. Spectrometers are used to absorb light and to break it down further into its spectral components. It can also digitize the signals which is a function of its wavelength in order for the scientist to interpret it easily. This telescope is expected to launch by October 2018 which is somewhere approximately three years from now. James Webb Space Telescope is different from Hubble Space Telescope in a way that Hubble has been orbiting the Earth since the last twenty five years but it is going to go to one of the Lagrangian points which is all the way out of the orbit Hubble revolves in. The Lagrangian point is a set of equilibrium points, five in number present in every Earth-Moon system and is 1.5 million kilometres away. This allows it to stay far enough from the Sun in order to stay cool and not being extremely hot. It also shelters it from the radiation omitted and also “prevents it from being blinded by its own infra-red light,” Jean-Louis Santini reported.